The year 1999 proved to be a very critical and complex time in the life of Zion Methodism in Georgia. For several decades, The African Methodist Episcopal Zion Church was “anchored” primarily out of the City of Atlanta. When its’ Flagship Church (Shaw Temple), was led to relocate to the Cobb County area (Smyrna, GA specifically), an unfortunate schism occurred. While change is inevitable, many persons; clergy and lay included, struggled to traverse the myriad of emotions and decisions during this trying season of separation. Through this process and amidst the schism -a new society was birthed. 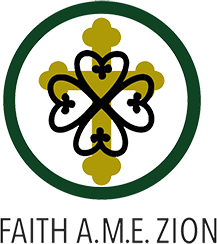 This society was formally received into “full connection”, as a church -to be known formally as the Faith A.M.E. Zion Church of Atlanta, GA. It was during the 132nd Session of the Georgia Annual Conference under the Episcopal leadership of the Right Reverend Dr. Joseph Johnson that Faith was brought into existence. They were chartered by over 80 members from Shaw Temple whom, at the time of the relocation, were adamant about maintaining Zion’s banner and presence in Georgia’s capital city. In lieu of their (former) Pastor and Presiding Elder now serving out of Smyrna, this tender remnant required seasoned, pastoral leadership. Having entered retirement from active pastoral ministry less than 24 hours prior to Faiths’ reception into the Annual Conference, Bishop Johnson appointed the Reverend Dr. Ndugu T’Offori-Atta (also known as George Thomas), to lead this community of believers. In 1999, the Reverend Dr. Ndugu G.B. T’Ofori Atta was called out of a one-day retirement to serve the newly formed Faith Church as pastoral guide. This was a particular blessing as “Dr. T” (affectionately referred to as), was a former Pastor of Shaw Temple during the 1970’s and had a tremendous relationship with several of those who desired to remain in Atlanta. His leadership stressed operating under the “5 points of light” (Worship, Prayer, Fellowship, Bible Study and Service). Over seven new ministries were birthed as a response to enacting these ministry points. “Dr. T”, as he was affectionately referred to, was a beloved academician and a published author. He utilized such gifts in framing the first church liturgy –an African Christian liturgy depicting our faith through a ministry life cycle. Members noted his consistent approach to worship and the work of the ministry with a spirituality that was unparalleled. Under his leadership, the congregation acquired 11 acres of land on Fairburn Road (debt free) as to engage the future plans of the ministry and meet expected growth from the current site. In 2005, The Reverend Lester A. McCorn was appointed to lead Faith A.M.E. Zion Church by the late Right Reverend Clarence Carr. He, his wife and their three children came to Faith by way of Chicago. Many members remembered him however, from his “college days” as a distinguished graduate of Morehouse College. Almost immediately, revitalization was commenced throughout the church. Organization and commissioning of new ministries (inclusive of the Daniel Prayer Ministry), began in addition to reframing the organizational leadership. Reverend McCorn instituted the “Five Ships of Ministry” (Discipleship, Worship, Stewardship, Fellowship and Leadership). It was also under this administration that guidance and leadership was given to a Lifestyle Stewardship Campaign. Faith also embraced “revival seasons”; being inspired seasonally by dynamic preaching and teaching. This campaign, with expansion in mind successfully raised $170,000 for future building initiatives. Reverend McCorn’s appointment to another charge in the midst of the conference year placed this stewardship campaign on hold. In 2008, following the departure of Reverend McCorn, the South Atlantic Episcopal District also welcomed a new Bishop, the Right Reverend Dr. Kenneth Monroe. Under Monroe’s Episcopal charge, the Reverend Jawwad J. Love was appointed to Faith. Under his administration, a new logo was developed; providing imagery to the (new) mission adopted by the church in transforming lives. He, his wife and their two children also helped lead enhancements in both our social media and outreach ministries. Specifically enhancements include: updated website, tent revivals, Angel Food and USDA food distribution. We also held “The T’Ofori-Atta Heritage Camp” in addition to establishing “Faith Press” (which has become the professional publication entity for the church). It has serviced The A.M.E. Zion Church from the connectional to the local district levels in addition to several professional and religious groups throughout the state of Georgia. At the conclusion of the 146th Session of the Georgia Annual Conference, Bishop Kenneth Monroe appointed the Reverend Reginald M. Morton pastor of the Faith Church. This was a historic marker for the church in that both Pastor Morton and his wife were members of our church as active lay persons under previous pastoral leadership. To have him return as Pastor (already noted as a ‘son of Faith’) was a blessing and well received by the congregation. Morton soon shared the emphasis of building disciples as to fulfill the mission: “People of Purpose Working on God’s Plan”. Bible studies, youth programs, health initiatives, community outreach and the launching of new ministries (seniors, singles, marriage, etc.) were all re-launched under his watch. It was also under his administration that the church regained financial stability. A swift transition occurred throughout our conference during the 2016-2017 year and the church was challenged with the departure of Pastor and Mrs. Morton for another charge. In June of 2017, the Reverend Brandon M. Moore accepted & received the assignment to serve the Faith A.M.E. Zion Church of Atlanta, GA. He received the appointment at the hand of the Right Reverend Dr. Mildred B. Hines. By the grace of God, there is already evidence of growth in both the spiritual and physical makeup of this great church -with renovations already have taken place in both the people and the physical edifice. “By Faith”, Pastor Moore embraces the love of GOD shared through Jesus Christ and is committed to serve God and follow Christ; expanding the Kingdom of GOD in the world. Per the critical foundation established by Reverend Morton and the membership prior to the transition and the immediate leadership provided by Reverend Moore, Faith was privileged to successfully host the historic 150th Session of the Georgia Annual Conference. To date, the church prayerfully seeks to follow God through the guidance of the Spirit. We are Determined to Know Christ and to make Christ Known. Informed by the righteous traditions of our mothers and fathers while embracing new vision and the re-branding of the Freedom Church in Atlanta, Faith will work with head and heart to be a become a healthy, dynamic church. Bearing witness to the goodness of the Lord and the transformative love of Jesus Christ.